This week’s blog is brought to you by Tawen. She’s one of our designers and specializes in the geography of Terah. The Vykati are her creation. When Terah was still very much a free floating idea, I mentioned to her that I could see at least one animal like or anthropomorphic race. I was partial to werewolves, but they’d mostly be human and have control over when they changed forms. Those familiar with the old Greyhawk setting might remember Greyhawk dragons. 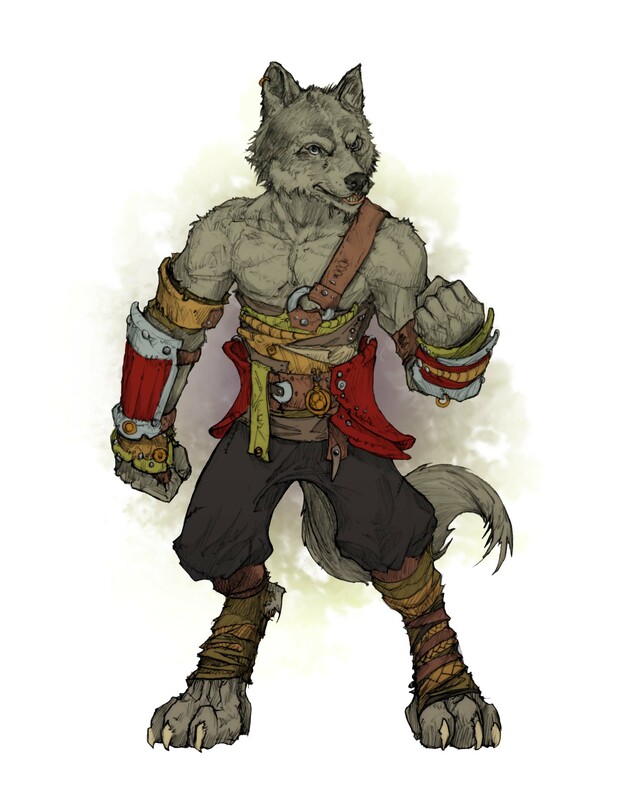 I kind of pictured a wolfy version of that. But I do make sure that I give designers a lot of leeway. If I kept Terah limited to just the ideas I came up with… well, lets say some dumb ideas, like trying to do half-elves in Terah, might have survived longer than they should have, and gnomes would not be the killer super spooky creepy things they are now. I’m happy with the direction the manacot… er, vykati have taken: a race trying to find itself in a quickly changing world, with a leader that’s either an idiot savant or perhaps, maybe, might really know what he’s doing. Other than the fact they’re amazing, you mean? From an evolution view-point, it makes no sense. The amount of time it would take wolves to evolve into what we are now would be ridiculous. It wouldn’t make much sense for Ahj to have made us either. Most of his sentient creations are pretty uniform. Hair on head, flat teeth, rectangular feet, oval head, no snout. Our stories say that thousands of years ago they were human once. We obtained our form in order to avoid death from the diseases of the jungle. There are two stories on exactly how it happened, one with a religious bias, and another from a druidic bias. As the previous blog stated, the Vykati are outcasts of sorts. That is starting to change, but many people still look down on them. I always thought that hating a race because they look funny was a stupid reason. Sure, some people might do it, but the most likely cause is actually some sort of preconceived notion on how the race will behave. In Galarion, Teiflings are outcasts because they’re related to beings of pure evil and half-orcs are outcasts because they’re related to a race that frequently burns down villages. Applying that reason to the Vykati wouldn’t work very well though, since most humans are familiar with wolves (Only Rhidayar never domesticated them into dogs) and the Vykati aren’t into rampaging and actually have a fairly strict moral code. So, why are they still outcasts? The first reason that came to my mind was their mouths. No, they don’t swear an unusual amount, but have you ever watched a wolf (or dog) chew? They can’t do it with their mouths closed; it’s not physiologically possible. We don’t think about it too much because A) They eat on the ground, away from our eye level and B) They don’t grind their food into a grimy mess; they can’t do that either, since their teeth are built wrong. To make up for this, they can swallow an alarming amount. So, what happens when you have a Vykati over and you offer them a dinner roll? The whole thing goes in their mouth. GLOMP. GLOMP. Gone. Add in shedding, panting, drooling, eating rare and raw meat, and tending to speak very loudly, and you now have someone you don’t want in your house. Of course, there are ways the Vykati combat this, and a Vykati ambassador will take steps to not gross anyone out. However, when a human commoner meets a Vykati commoner, the human is going to leave pretty weirded out. The higher class Vykati are working on educating the lower class Vykati about basic etiquette, but there is still plenty of room for improvement. Benayle is a (never would have guessed) Vykati barbarian who led his people and the surrounding human settlements into a rebellion that kicked the high elves out of Vykati lands; he helped spur the native races into the understanding of technology they have today, and helped restore the University of Vidava which is now the world center for technology, science, religion, and pretty much anything else you can think of. So, we have a super-genius barbarian? Well, no, not really. In some ways he’s actually kind of a dunce. If you give Benayle a piece of broken technology and ask him to fix it, he’ll shake it a few times, bang it against his head, and ask if the manufacturer has a refund policy. His understanding of technology, while beyond that of the average Vykati, is still basic at best. He had an elementary education in math and science and is fluent in a few languages, but anything beyond that he’s not entirely sure on. The whole schpeel on the origins of the Vykati was memorized after the fifth time a student asked him about it. Benayle isn’t the first Vykati leader to have attempted all this, and some of the previous ones met with more success when dealing with other nations. However, they didn’t meet with as much success at home. They attempted to enforce the human rules of etiquette and suggested that the way the Vykati acted was wrong. While the Vykati had a lot of respect for these leaders, being told their way of life was wrong because the humans said so didn’t go too well. On the other hand, Benayle continues to act like a Vykati when he’s home and encourages his people to do the same, but to be more careful when traveling in the human lands or when they have guests over. He also spends a great deal of time explaining Vykati practices to other races and extolling them to be more tolerant. This approach goes over a lot better with the Vykati. As a matter of fact, in Drtithen (the Vykati capital city) there is a huge birthday celebration every year for Benayle. He thinks it’s a little extreme but he allows it to go on because there’s always lots of cake. 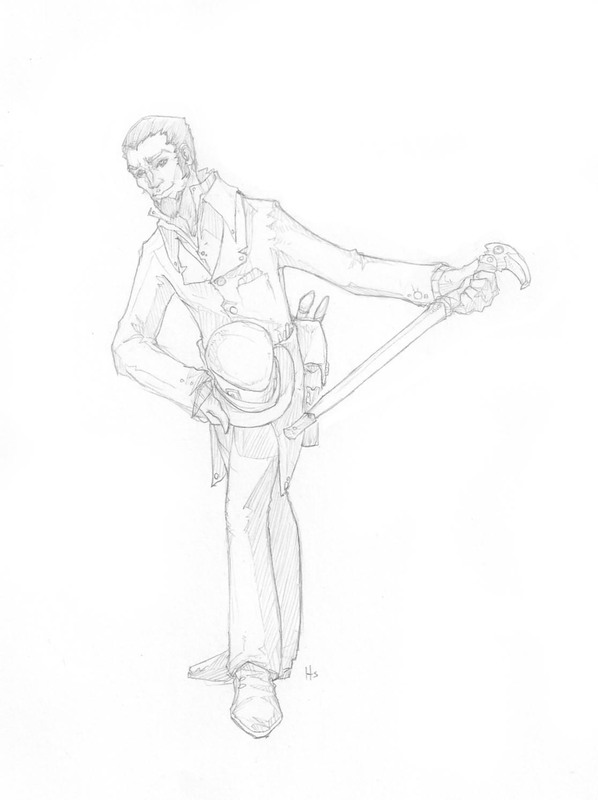 Benayle is a sample of a new race we’re introducing in Terah. They have a really rich history that is India flavored. Right now that’s the part of the world most heavily being worked on. I’m told they are basically outcasts from normal society that are doing their best to fit in with all the changes. As world travel increased, their race found an unexpected niche. Like their cousins, the wolves, their bodies produce their own vitamin C. This makes them immune to scurvy and gives them a very positive edge in jobs that require a lot of travel, such as sailing, both on the sea and in the air. While science has linked the problem successfully, cargo space can be used more effectively if it doesn’t have to be taken up with something that wants to rot. One of my goals in Terah from the start, was to limit the number of sentient races. The world of Victorian England, which figures heavily into the game’s culture, really only saw one race–the human race. The original plan was elves and humans. Dwarves were added later, not for any other reason than that having elves seemed to demand having dwarves. Gnomes I did because gnomes can be fun and with the right seasoning, can add a very non-human or outside perspective to the game. I view dwarves and elves as subsets of humans, not because of any weird geeky science or genetics, but simply because you can find their cultures entrenched in human culture. I added a twist by giving them somewhat new cultures, but made sure that they still represent subsets of our modern culture. You will find their cultures in many places throughout the world. All three are present in the modern USA. Vykati, like Benayle, are a bit of a hybrid of my thinking on gnomes and elves. They are part of a traditional culture, but they are forced to view that culture from the outside. Of all the races, I think geeks will find a bit more to relate to in that. Be sure to stay tuned. There’s more in-depth stuff coming on the Vykati in general and Benayle in specific. A big question that I keep getting on Terah is “What’s the technology like?” As I mentioned in another blog post, two of the races in Terah come from much more advanced civiliazations. Both lived in a society only slightly more advanced than ours. They were further ahead in space travel, but about the same in polution and ecology. In the case of the high elves, they based their civilization around technology. The dark elves based theirs around magic. When they were forced to leave their world, they lost a lot of what they had. Not only in friends, relatives, homes, property, pets, and comforts, they both lost some of their advancements as well. For the high elves, this was due to the fact that in their hurry to leave, they were unable to bring an infrastructure that as capable of continuing production of what they needed. Sure you have the computer, but 1) where do you plug it in? and 2) how do you produce the chips and boards to replace it? Where are the resources you need to do that and how do you mine them when the only equipment you brought is war machines? The dark elves had a different problem. While physics and science remained the same on both worlds, magic did not. Some spells worked fine, mostly spells that relied on the divine, but many of the spells that made their society what it was, the advanced spells that required a heavy reliance on the arcane, were non-functioning. This required both sides to give up their pre-occupation with either just technology or just magic and make deals with the locals. The result is what defines technology in Terah today. The locals jumped ahead a bit and the elves were able to be a little more comfortable. The result is a technology that mixes steam, magic, and clockwork. Information technology–about the late fifties and early sixties. There are computers, but they are huge behemoths. Magic gives them more personality than what you’d expect. In terah, they are steam driven engines that use gears for their counting and programming. Software doesn’t really exist. Programs are run from bronze cast boxes of gears. Each computer uses a different sized box, so its programs must be custom written for it. Communication: Very short range, steam powered radio. Most homes have a radio, but like our swamp coolers, and small air conditioning devices, the radio must have a good portion of itself outside the home. Power grids and utilities: Most homes have electricity, but not a lot of it. Power plants are (you guessed right) steam driven, and use turbines the size of a city block. The vast majority of this goes to power industry and production. Homes and residences that need more than what it takes to power lightbulbs and a personal radio are for the very rich. Most homes use natural gas for cooking and heating. Natural gas is so plentiful in terah, that it’s even used in some places in place of coal in the power plants. A home that uses no electricity and only natural gas is not uncommon. Then again, neither are cabon monoxide related deaths, especially in dwarven cities. Transportation–the horseless carriage and some commerical haulers. All powered by steam and natural gas. Weapons–I plan on doing a whole post on these, but pretty much, you can place it at about the Victorian Age from our world as far as possible damage goes. Steamtech has produced quite a wide range of interesting and bizarre projectile weapons. Black powder is so last century. The first adventure path centers around lost dwarven steamtech and gives GMs and players a taste of the history and technology that is Terah. 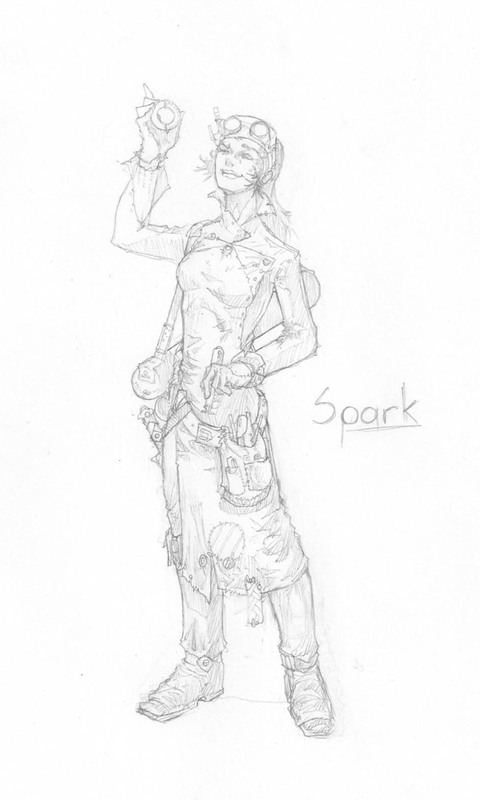 “Spark” is (c) 2000-2010 by Phil and Kaja Foglio. Used with permission. Visit http://girlgeniusonline.com to see one of the works that inspired Terah. A few months ago, very few people knew about the Terah Project outside of family, friends, and few freelance artists and writers. That’s slowly changing. In addition to things that will be mentioned on the Paizo boards (search for Terah Project there to find it easily) this blog will serve as means to give out additional sneak peaks and even some information that might not be available anywhere else until much after launch. When I began this project, I thought there would be certain big questions that’d I’d see often. I’m surprised by what those questions have been. I expected to have people comment on the name and ask where it came from (I’m always interested in hearing name stories). That’s an easy question to answer. Terah is an anagram of Earth, both literally, and metaphorically. It’s designed to make creators and players alike question things about ourselves. I expected there would be questions about the history. These could only be answered in depth by reading the material when it comes out. In the way of a teaser, the history of Terah is actually the history of two worlds. Two races of elves entered into a long conflict over which would be superior: magic or technology. They destroyed their own world (now only remembered to them as “the other world) and fled to Terah. The survivors, forced into a world where magic worked slightly differently and where there was no infrastructure to develop existing technology, learned to mesh what they did know with the indigenous population of dwarves and humans. And that leads me to the big question I keep getting that I didn’t expect. What’s with the gnomes? They’re in that brief overview of history, but its hard to see them. The elves were of two varieties: high elves and dark elves (not drow Driz… er darnit.) The high elves had enslaved the gnomes. The dark elves had been slowly freeing gnomes and transporting them to Terah. The dark elves thought the high elves had enslaved the gnomes because high elves had no moral code. Afterall they used technology and how can you trust that? The dwarves, whom the gnomes were sent to live with in Terah after they’d been freed, stumbled on the real reason soon enough. While slavery isn’t good, it might just happen to be a few rungs up the moral ladder from genocide. Gnomes are not inherently good. Its not that they’re inherently evil either, but they have an odd grasp of what is right and wrong. And this is what seems to spark the most curiousity in people. My original thought about what people would do with that bit of information was pretty old school. I figured they’d do like I always do and just kind of wing it when it came up. That’s not a good answer anymore apparently. So I have a couple of suggestions on how to play that out. The first still falls back a lot on the whole winging it thing, but it still works. Take the character you want to have other people see. Round that out just like all the good role-players teach you to do. Now take a single (just one. Five is right out) social boundary and eliminate it. This is something that the gnome cannot perceive as being wrong. It could be something as simple as standing inside event the most lenient of person’s personal space. It could be that they talk too loudly. It could be that they have no sense of personal property. But whatever you eliminate, you have to eliminate it completely. If killing is ok, then trying to kill him is ok too. If there’s no such thing as personal property, then he doesn’t give a care for his own. If he talks too loudly, then no one can possibly talk too loudly to him or be too much in his personal space or whatever. There’s one other trait with gnomes that’s universal and this is the one that people find the most disturbing: small amounts of pain being inflicted on other creatures is very funny to them. Want to know where that limit is? Well their society actually defines it. “It can’t cause anymore pain or anymore blood than a number 4 needle.” The problem comes in one what size a number 4 needle really is (no one knows) and how much force can be used behind it.